Cyber Monday sales are starting early at Tripawds. 🙂 And three is a magic number…so you can save all week in three Tripawds Featured Blogs! Three Legs and a Spare = $3.00 Off! Loving Life on Three Legs = $3.00 Off! Tripawds E-book Library = $3.00 Off! 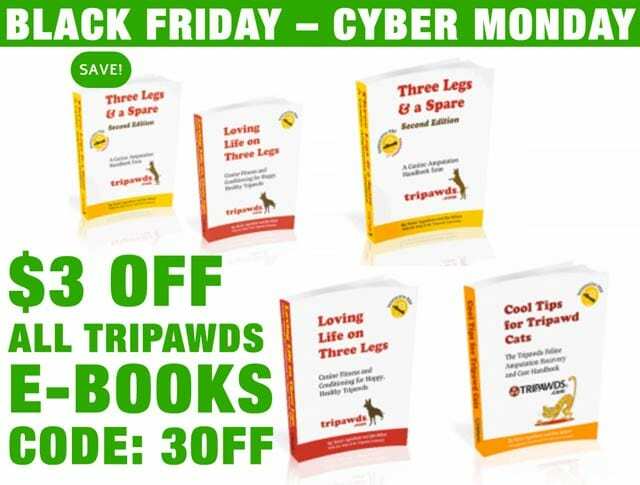 Cool Tips for Tripawd Cats = $3.00 Off! Use coupon code “3OFF” at checkout to receive $3 off each e-book in your shopping cart. This offer is valid all weekend. Coupon applies to all Tripawds pet amputation e-books* and expires at midnight on Cyber Monday, November 26, 2018. 😮 NOTE: The Tripawds 3OFF coupon is also valid for savings in the Tripawds Gear Shop AND Tripawds Gifts Shop! *Name Your Price KillBarney Tour e-book excluded. Consider adding a copy to your cart with the money you save! As always, Tripawd Heroes is available for free download and comes with some of the best tips for new Tripawd parents.